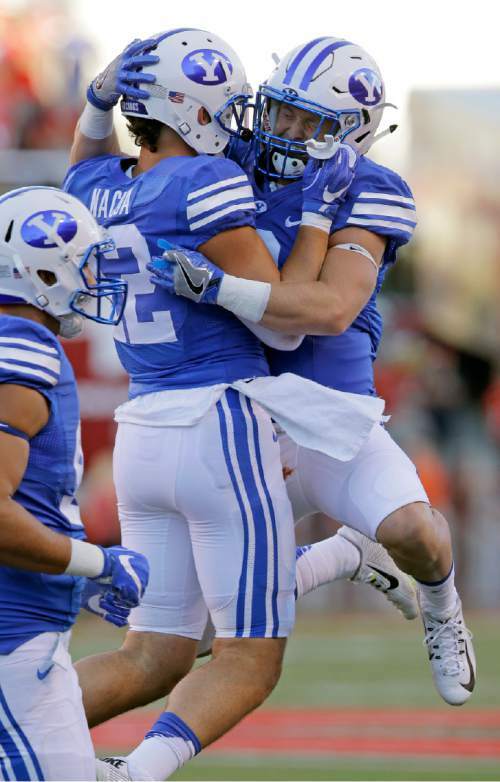 BYU football notes • Coaches say depth help them overcome Nacua's suspension. Provo • Ed Lamb isn&apos;t panicking. Instead, BYU&apos;s assistant head coach, safeties coach and special teams coordinator sees the first-half suspension of star free safety Kai Nacua against UCLA on Saturday night (8:15 p.m. MT, ESPN2) as a golden opportunity for others among his deep group of safeties to show what they can do. Nacua and backup cornerback Austin McChesney must sit out the first half, per NCAA rules, after being flagged for targeting in the third quarter of last week&apos;s 20-19 loss to Utah. Lamb said senior Eric Takenaka and junior Matt Hadley will rotate in with strong safety Micah Hannemann, but did not say who will start. "Matt and Eric have played significantly already this season, and played really well for us," Lamb said. "The next couple of guys up, Tanner Jacobson and Zayne Anderson, could see [playing] time this week as well." Lamb said in preseason training camp that safety was perhaps the deepest position on the team, and he reiterated that Tuesday after practice. "We are really confident in six of our guys, and I think there are some younger players that, had situations been a little different, we could have gotten them ready to go as well," he said. Even before McChesney was ejected, the Cougars had shuttled several players in and out at left cornerback. Redshirt freshman Dayan Lake started in the place of the injured Troy Warner, the starter against Arizona. The next time Utah got the ball after Francis Bernard intercepted Troy Williams on the play in which McChesney was penalized, the Utes went after Chris Wilcox. 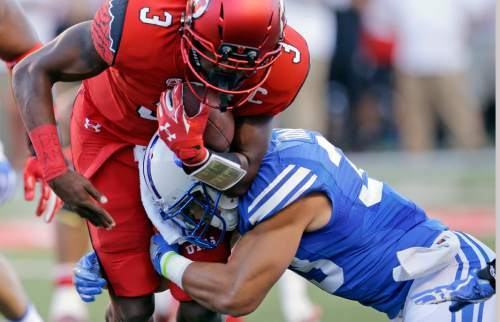 The freshman was hit with a pass-interference penalty on third-and-15, and Utah eventually kicked a field goal on the drive. BYU defensive coordinator Ilaisa Tuiaki isn&apos;t saying who will start against the Bruins, but said he was impressed with how Wilcox settled down after the penalty and played reasonably well. UCLA&apos;s Jim Mora didn&apos;t have to face Taysom Hill last year when the Bruins beat BYU 24-23 at the Rose Bowl, but the coach said Monday he has certainly followed the fifth-year senior&apos;s injury-plagued career. "He is resilient. He is competitive. He is tough. He has had to overcome a lot of adversity, a lot of injuries. And he just keeps showing up and competing like crazy," Mora said. "If you watched the Utah game, you saw some great runs. You saw just what you would expect from him, that toughness, that grit, that he has displayed his whole career." Tanner Mangum made his second career start last year against UCLA, completing 30 of 47 passes for 244 yards and a touchdown. 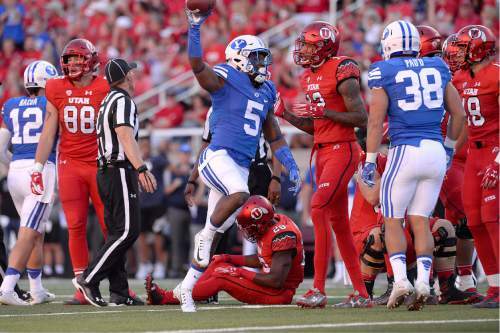 The Cougars are 8-3 in home openers since 2005 and have won four straight home openers. They went undefeated at home last year. … Saturday&apos;s game is being billed as a "Stripe the Stadium" game. Fans sitting in odd sections are encouraged to wear blue and even sections and the student sections will wear white. … Twelve different players have caught passes in the first two games, most notably offensive lineman Ului Lapuaho on a deflected pass and defensive end Corbin Kaufusi on a play out of a field goal formation. Last year, 19 Cougars had at least one reception.